When I first though of doing "The Great World of Darkness Chronicle." 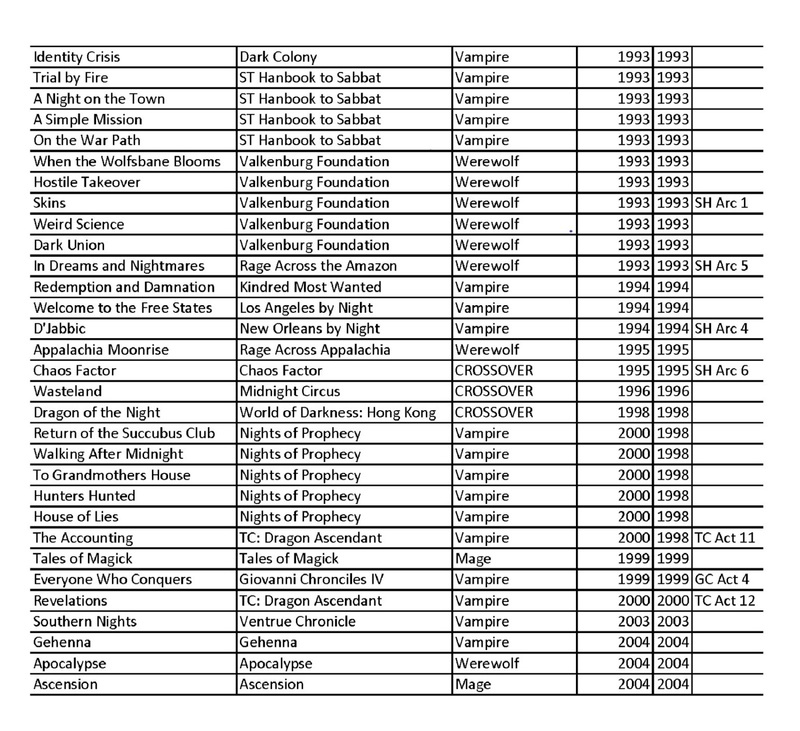 my intention was to run a solo game of various groups through all, or at least most, of the pre-published stories for Vampire, Werewolf, and Mage. Knowing that most of these are, eh, let's just say "thoroughly plotted", my thought was to heavily intersperse these tales with my own custom and randomly generated stories. Well, I've spend the past day or so trying to come up with a complete list of the adventures. So far, this is what I have. I spent far too much time trying to get blogger to post these images at the same size. Now, looking at this, a couple of thoughts pop into my head. First, I'm clearly missing a few adventures. Possibly quite a few. My main source was the fan-based White Wolf Wiki and I know for a fact they were missing some. Unfortunately, I couldn't find anything close to a better source. 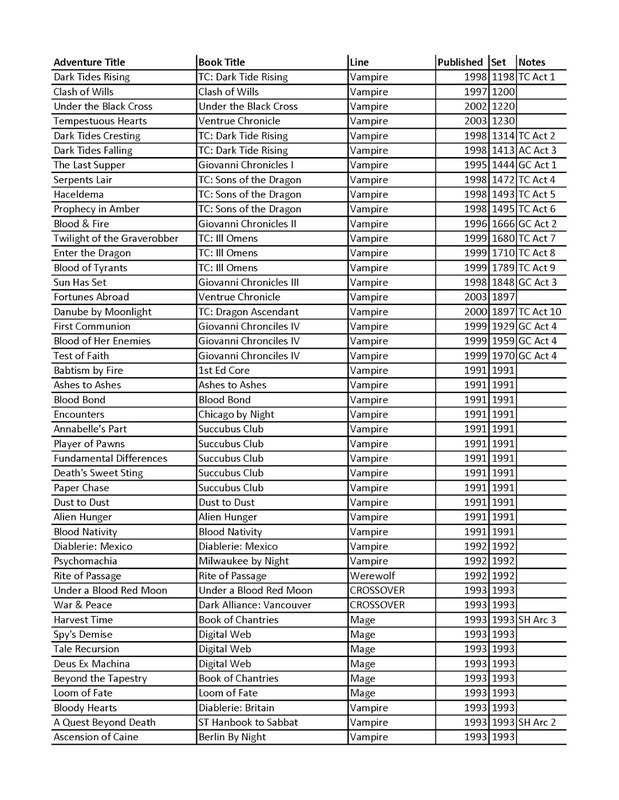 Even drivethrurpg didn't come close to the Wiki as far as showing what adventures were in which book. If you see any glaring holes, please let me know. Secondly, this is a LOT of material. Like, far more than I think I really appreciated when I first began exploring this idea. My initial thought of a "best case scenario" for the time line of this project assumed roughly a week or so per adventure, and even at that ludicrous pace, it would take me roughly a year and half. And there is no way I'd be able to maintain that pace. This is going to be a multi-year project. And you know what? I still want to try it. Sure, it may take a laughably long time to complete, but the focus is on having fun, not maintaining any sort of specific pace. There will be weeks and months where I let it lie fallow as I explore other ideas or just take a breather for a bit. Then, hopefully, there will be a fresh rush as I head back into it. It's going to be interesting, at least. After the relative success of my solo Let's Play Alien Hunger (success, in this case, being defined by the fun I had while playing/writing it, not on any other metric), I want to try something similar, but far more expansive. 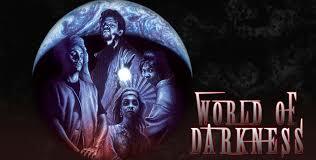 I want to solo "The Great World of Darkness Chronicle." Essentially, I want to go through all, or at least most, of the published adventures, starting from the earliest and leading up to the Gehenna books. Of course, "Great World of Darkness Chronicle" is a bit of a misnomer--I'm really just interested in doing the Vampire, Werewolf, and Mage games. Even that will be a tremendous undertaking, particularly since family, work, other "standard games" (running one and playing in another as of this writing), and the annoying thing we call "real life" will take up a huge amount of my time. Best case scenario, it will take me a year or so to get through everything. If I'm being honest, probably quite a bit more. Particularly since I'll most likely step outside the published adventures from time to time, to do more personal stories, deal with the fall out of things that happened, and just stretch a bit of creative muscle. But still, I think It will be fun, if a bit sporadic. I certainly won't try to maintain any sort of posting regularity. Besides the sheer size of the thing, there are a couple of issues that I'm facing with this idea. First, I don't know all of the adventures, particularly for Werewolf and Mage. 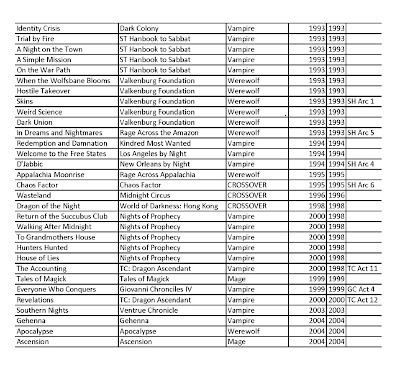 I have a decent number of the earliest ones (Rite of Passage, Valkenburg Foundation, Loom of Fate), but my library is embarrassing lite for these games. Anyone know if there's a list out there? Third, I'm not sure what to do about the big, historical epics--the Transylvania and Giovanni Chronicles (and, to a lesser extent, the Ventrue Chronicles). Do I run the Chronicle chronologically, starting with Transylvania and moving forward century by century until the 1990's and the explosion of the other games? Do I run them in the order they were published? So, start with Ashes to Ashes, but do a time jump back to the Dark Ages when the time comes? Just ignore them completely? The advantage of going chronologically is that it allows for the grand sweep of history I'm looking for. Prophecies made in earlier stories for one group of characters might come true for a different group centuries later. Also, the characters can have more freedom of action, allowing them to shape the future World when we get there. Finally, these Elders can exist as sires, patrons, or foes of the younger characters in the modern nights. The downside is, well, that means a LOT of Vampire and history in the beginning of the Chronicle. Now, I love Vampire, but I want to be able to branch out to the other games as well. 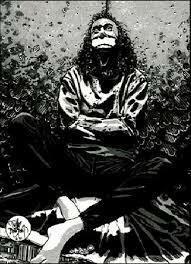 My original plan was to do a bunch of Camarilla/Anarch stories in and around Chicago, then a few Sabbat and Werewolf stories leading up to Under a Blood Red Moon, then split up for their own stories, including cross overs (such as the Samuel Haight adventures), until we come to the End Times. Obviously, there will be multiple parties of characters involved--Camarilla Vampires, Sabbat Vampires, Mages, and Werewolves. Heck, I can even see using this to further the stories of Damon, Trent, and Maya, since they're the most likely to be wandering around city by city. So, what do you guys think? Is this just an insane idea? Should I include the historical games? Chronologically or in order of publishing? 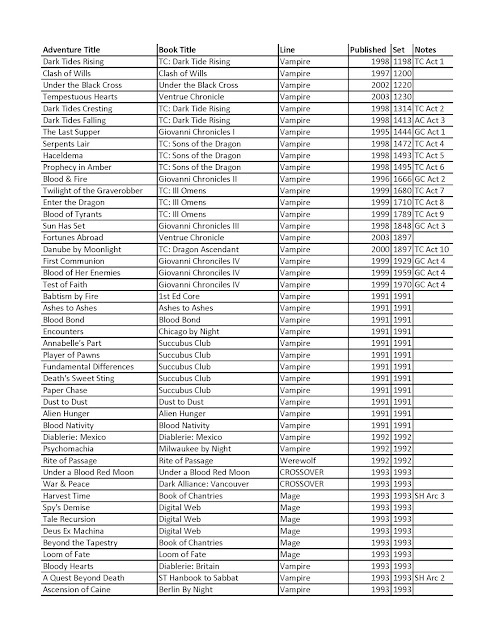 Any idea on where to get a complete list of all the adventures for the game lines? Skip the apocalyptic scenarios and prep to move into the "5th Ed" world? Something blindly obvious that I'm missing?